What is the Ice Guardian Sign / Ice Warning Sign ? 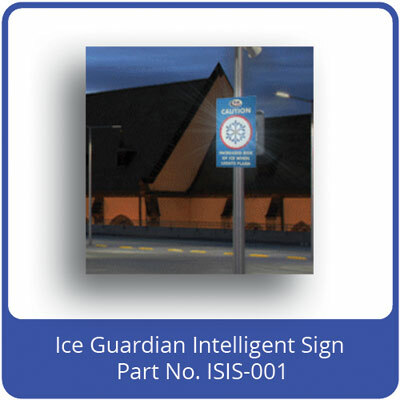 Manufactured exclusively for Limelight Signs, QAT's Ice Guardian Sign was designed to replace the older, mechanical Ice Alert sign, the Ice Guardian uses latest PIC chip technology with no moving parts, to create a far more visible warning. The sign is in the form of an ISO standard ice crystal warning logo with ultra-bright blue LED's located at the 6 points. These flash when the air temperature approaches freezing. Available with fixings for both post and wall mount. The ice warning sign has built-in batteries so requires no mains power connection and the patent protection design allows the batteries to last 2-3 years. Easy installation - no wires, no mess, no fuss. The Ice Guardian warning sign is a necessity for all companies to whom want to minimise the risk of ice related accidents on their sites, influencing both pedestrians and drivers to take more care in icy conditions. The Ice Guardian sign is generally used for off-highway applications including: quarry sites, campuses, car parks, oil rigs etc. They may be used to warn traffic as well as pedestrians. The sign is constructed of plastic and houses a circuit board in a sealed enclosure. The circuit board is powered directly from 6 off AA alkaline batteries in a rear compartment protected with a weather-proof bung. A sensor on the circuit board triggers a flashing sequence when the temperature reaches 3 degrees C. The LED's flash for 30 mS every 2 seconds, thus preserving power. Electrical power is further minimised by switching the PIC chip to sleep mode when not required. The combined effect of these is to give the sign a 2 to 3 year life per set of batteries. Batteries housed in a weather-proof enclosure are easily changed when required. When first powered up, the sign flashes out the temperature in degrees C followed by a 5 minute flashing sequence (regardless of temperature). This sequence allows the electronics and sensor to be self-checked and the sign to be demonstrated. This sequence is also useful when positioning the sign. After this sequence the sign becomes operational in the normal ice detection mode. The main advantage of the Ice Guardian is that it has no mechanical parts and is totally sealed to the weather. This makes the unit extremely reliable, never requiring any maintenance and just a battery change every few years. The LED's are very visible in daylight, more so at night and have a wide angle of inclusion.